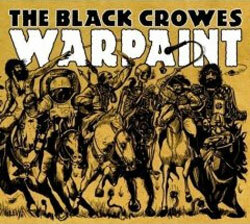 At the risk of overstatement‚ The Black Crowes' Warpaint is a godsend‚ an alternately noisy and contemplative act of deliverance by a group of perpetual underachievers. The ineffable charm of The Black Crowes in their prime is evident within seconds of the beginning of "Daughters of the Revolution." By the time the album reaches its somewhat muted conclusion ten tracks later‚ it has fulfilled the promise of great things that has never materialized from this band except in passing flashes‚ since the release of 1994's Amorica. Produced‚ engineered and mixed by Paul Stacey‚ erstwhile member of Chris Robinson's solo band‚ New Earth Mud‚ and interim guitarist for the Crowes in the wake of Marc Ford's departure in 2006‚ the chemistry is palpable throughout the album. On "Evergreen‚" the sly nonchalance of Chris Robinson's vocals is no more prominent than the rhythmic axis of his brother‚ guitarist Rich‚ in tandem with longtime drummer Steve Gorman (like Bill Wyman in the Stones‚ bassist Sven Pipien is more felt than heard). But the essential and ultimately crucial element of Warpaint is the low-key presence of Luther Dickinson. The dirty guitar licks of The North Mississippi Allstars' lynchpin alternately contrast the sparkling piano of keyboardist Adam McDougall (another new recruit to the group) on "Walk Believer Walk‚" or match that radiant tone on "Locust Street." Dickinson is as comfortable playing an acoustic guitar as an electric one‚ which helps sustain the momentum of the folky likes of "Josephine." No question The Black Crowes still echo the Rolling Stones because the prophetic likes of "Wee Who See the Deep" echoes the portent of "Gimme Shelter." But with Luther restoring a sense of spontaneous purity to the whole band's interactions‚ the Robinson brothers effectively confront and transcend their own history here. And Dickinson's restricted access to the group - while he works with North Mississippi Allstars‚ The Word or John Hiatt - may very well be that limitation turned to strength: The Crowes will have to make the best possible use of their time when they have this gifted instrumentalist available. Notwithstanding the organ that wafts in and around crisp electric piano notes on the philosophical melancholy of "There's Gold in Them Hills‚" Warpaint in total should nevertheless restore the ring of truth to 'rock and roll' for those to whom the phrase has become a cliché. For the rest of us‚ it signals redemption to share with this much-maligned band.